When TIE fighter attack the Ghost, it’s up to the cranky astromech droid, Chopper, to keep the ship together. If only his crewmates would decide whether they want him to repair the shields or the intercom…or the shields…or the intercom. This children’s book tells a story of Chopper, the cranky droid, saving the Ghost from a TIE fighter attack when Kana and Hera have a little trouble. It shows a quick view of the quirky, special relationship Hera, Kanan and Chopper have, which you can tell is quite sarcastic. The images are taken straight from the show itself, and they look just as amazing on paper as they do on screen. They book does a great job of showing children how to read and write the structure of dialogue. Quick little paragraphs per page that are shared with the beautiful images really work well together to tell a quick story. Its not a very long book which makes it great for a quick little fix of Star Wars Rebels for the kids. The book comes with little stickers in the front and back of the book consisting of Hera, Kanan, the heroic Chopper with some TIE fighters, logos, and the infamous Ghost. I highly recommend this book for kids just learning to read. Plus what kid doesn’t like stickers? I know if I was a kid I would be putting those stickers everywhere! 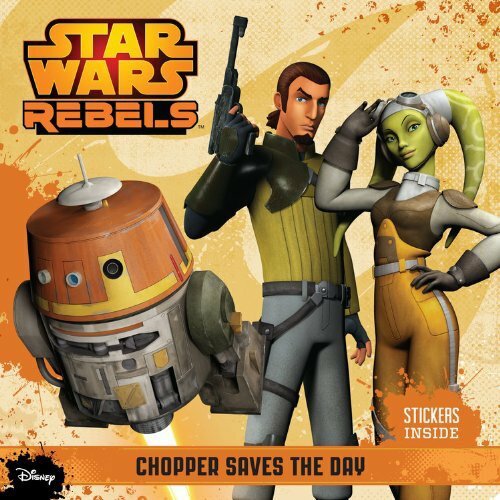 Star Wars Rebels: Chopper Saves the Day is available to purchase on Amazon, or you can pick it up at your local book store when it is released on August 5th, 2014.